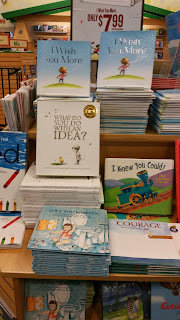 Last month I was in the USA and naturally I looked at picture books in shops. How could I not?! 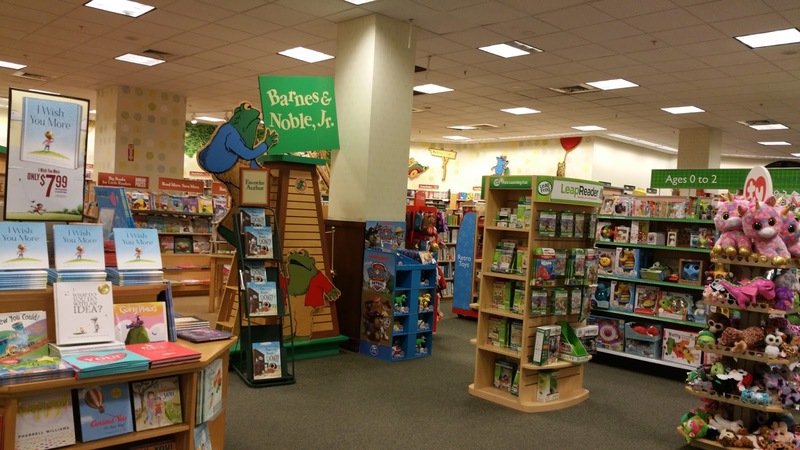 This included Barnes & Noble bookstores in three states. As a major chain I assumed Barnes & Noble in the US would be very similar to Waterstones in the UK. Yes and no. 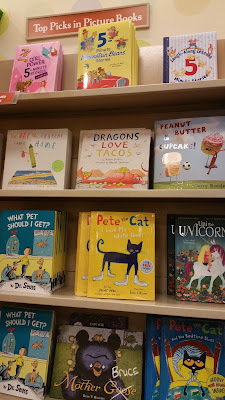 I began to notice there were some differences between the US and UK picture-book sections and I thought I'd share my unscientific observations. Of course I haven't forgotten there are lots of brilliant independent bookstores in both countries but they don't have to follow standardised directives from Head Office and so they're more individual and can't be compared in the same way. 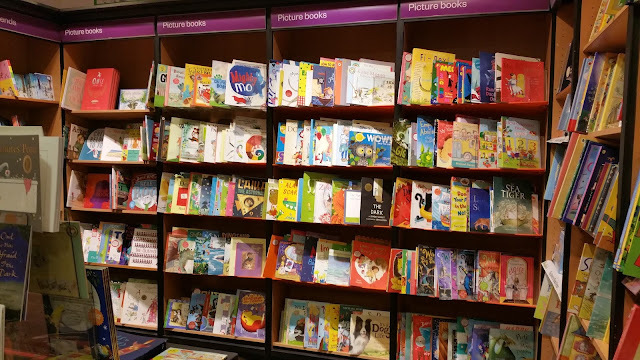 The main picture book section was made up of hardbacks. Selected books are front facing and the rest are spine outwards. because the spine of a paperback is insignificant. 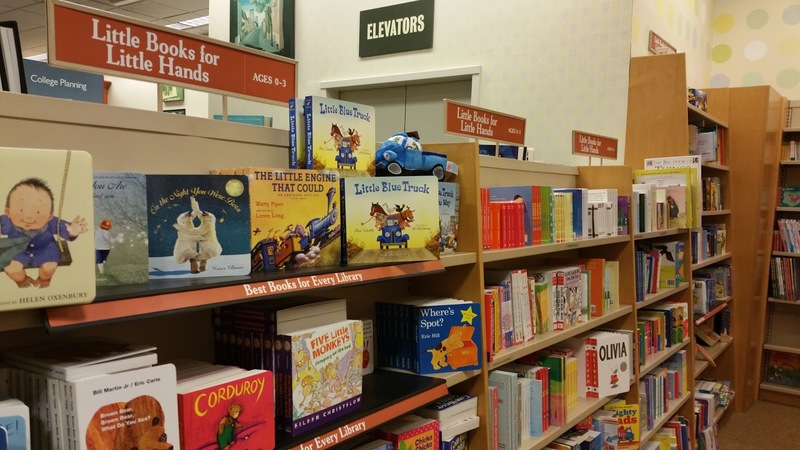 To me the biggest difference was the dominance of hardback picture books (with jackets) in Barnes & Noble. I’d love a knowledgeable person to explain to me why there's such an emphasis on hardbacks in the US. I’m truly baffled and appreciate there must be a reason. Perhaps it's because hardbacks have shelf presence and you can easily read the spine. They’re substantial and feel gorgeous, especially with decorative endpapers. Unfortunately though, US picture book hardbacks are typically $17.99 (c£12) which is expensive for an everyday item. So are they mainly purchased as gifts? Does this mean Americans buy fewer picture books or do they simply spend more? A British paperback picture book is typically £6.99 (c$10), and special offers often lower this further. So per family, do we buy more picture books in the UK? I've no idea, although I'm told the US doesn't have the equivalent of Book Start. With the majority of picture books in Barnes & Noble being pricey hardbacks, I wonder if this discourages the adult from allowing the child to pick a book that might not appeal to the parent? Also, I noticed many of the hardbacks seemed aimed at older children and perhaps this is a sign that in the US picture books aren’t cast aside (by adults – never children) when the child reaches five years. I wish the reading of picture books by older children was encouraged more in the UK. I don't think many British parents realise how sophisticated picture books can be and how they promote discussion. 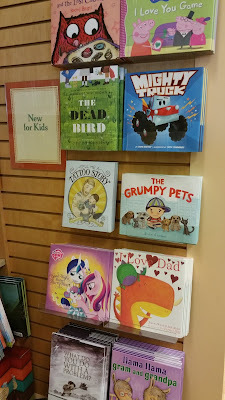 Despite the plethora of love books, funny books and moral themes in Barnes & Noble, I noticed a ‘grumpiness’ theme too. That surprised me. I remember submitting a ‘grumpy’ book in the UK a few years ago and received feedback that the grumpy adult hippo was too irresponsible in terms of caring for the little hippo. Perhaps I was unknowingly following a grumpy, humorous American zeitgeist! 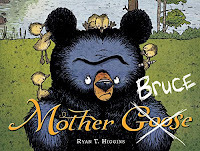 In fact, more than in the UK, I thought quite a few US books seemed to push way beyond the boundaries of cute and cuddly, with exaggerated humour that often poked fun at poor parenting (more so than in the UK). Plus the style of many illustrations wasn't quite the same as in the UK (often more cartoony in an adult way - though it's hard to put my finger on it). 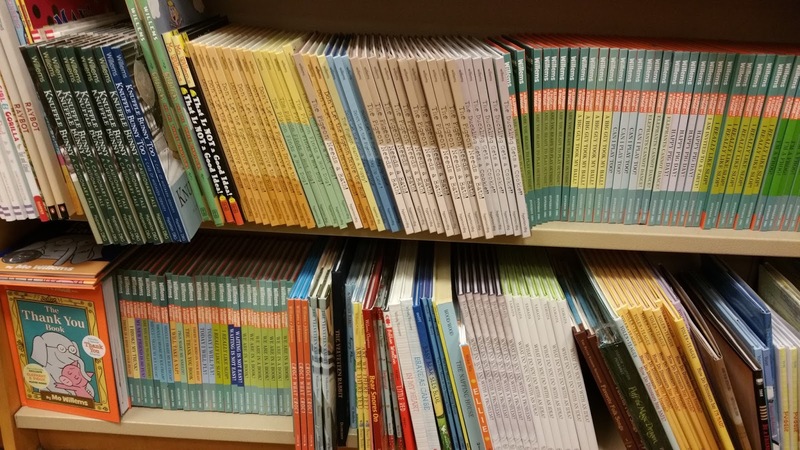 More picture book shelves from another B&N. Lots of hardback picture books squeezed onto the shelves and the hardback spines allow for identification. doesn't seem to encourage browsing, but they can squeeze more books on the shelves. It's much easier to make a choice when the covers can be seen. 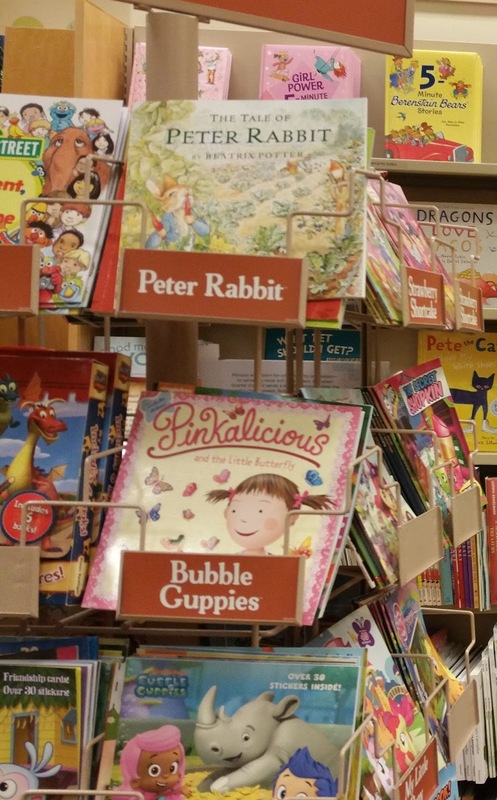 Visibility is a perennial problem for picture books. Rhyming picture books used to be much more popular with publishers in the US than UK. I suspect that was because the US internal market is huge and they didn’t worry about overseas co-editions and translations as much as UK publishers. 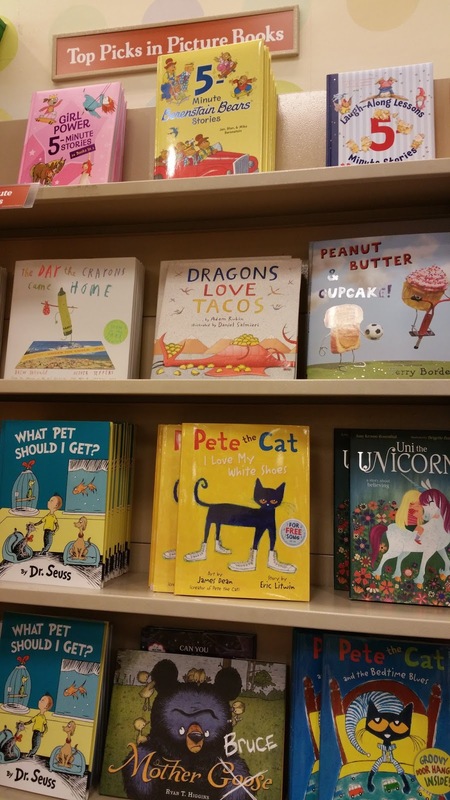 So in the US there has always been a high number of rhyming picture books and Dr Seuss continues to remain far more prominent than in the UK. Meanwhile in the UK, rhyme is still growing on the back of the phenomenal success of Julia Donaldson. 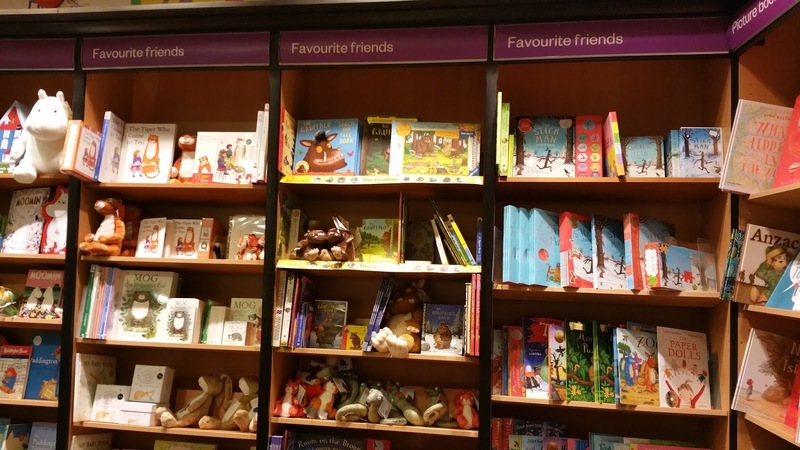 Nowadays every Waterstones in the UK appears to have a large section devoted to Julia Donaldson's rhyming picture books, but I didn’t see this in Barnes & Noble in the US and only noticed one of her books: The Gruffalo. Instead, the author with the most shelf space in the US Barnes & Nobles appeared to be Mo Williems. We enjoy his Pigeon books in the UK (eg Don't Let the Pigeon Drive the Bus), though his other humorous books haven’t taken off in the UK in the same way as in the US. B&N US The author with the most shelf space was Mo Williems. More than two thirds of the books in this photo are by this author/illustrator. Waterstones UK I suspect you can guess the author with the most shelf space in the UK! Two thirds of this photo is linked to Julia Donaldson (books and merchandise). Now it’s time for my greatest befuddlement. Why do almost all the American hardbacks in Barnes & Noble have flimsy, tearable, non-child-friendly jackets? Am I the only one who thinks this is madness?! I know some UK publishers add jackets to hardbacks too, but not to the same extent. And now I’ve thought about it, the lovely hardback versions of my No More Yawning and No More Biscuits didn’t have jackets in the UK, but they did in the US. I wonder what happens to these jackets? Do American parents remove the jackets when they get them home? Or are the jacketed hardbacks kept on a special shelf in case they’re damaged? Are additional jackets still run off the printing press so booksellers have extras (which need to be stored). It’s beyond me – please will somebody explain!! I’ll stop ranting and move on to something I liked: the Little Books for Little Hands section in Barnes & Noble that's aimed at 0-3 years. The title of the section says it all. They’re robust board books of classic, truncated and new stories and are strongly constructed for children to handle (chew, stomp, pull, share...). I thought this section was larger than the board book section you’ll find in a UK Waterstones. Perhaps it's to make up for the plethora of pricey US hardbacks? 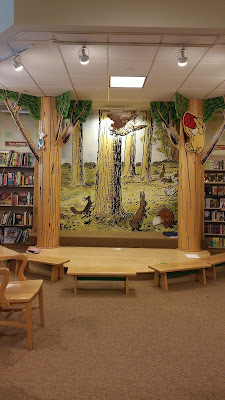 the same stage in the children's section. A lovely idea for events to bring in customers, though perhaps US stores have more space than Waterstones in the UK? Plus I felt a labelled box of books for sharing (with B&N stickers to show they're not regular stock) would be nice to encourage use of the empty area outside of performances. I wasn't so wild about all the toys sold in Barnes & Noble stores and they're far more appealing to young children's than rows of hardbacks with just the spines on show. 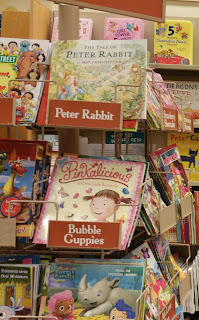 Also new to me at Barnes & Noble were the small, cheap paperback versions of picture books (smaller than typical paperback picture books in the UK). Proportionately there weren't many of these and they were displayed on one or two revolving stands with covers facing outwards.The selection isn’t large and seems to be aimed more at young children reading for themselves. Series and classic bestseller books appear to predominate and my latest US version of I’ll Always Love You is the right size to fit into these stands (ie squarer and smaller than normal picture books). Whatever my comments, I enjoyed perusing the bookshops in the US and I apologise for not buying many picture books but my suitcase was already stuffed (it didn't help that I was a nut case who brought a full-size pillow along on my travels!). Even so, I couldn’t leave empty handed and squeezed in four books. 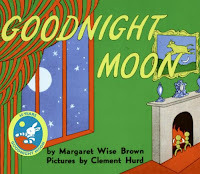 Only one of those four books may be found on the shelves of Waterstones in the UK (Goodnight Moon), though most can be ordered. I’m somebody who’ll always buy books, whether they’re US hardbacks or cheaper UK paperbacks. Unfortunately this isn’t true of everybody which is why I’m not sure it helps if the newest and most diverse books can only be found in an expensive hardback format in Barnes & Noble bookstores in the US. Would Barnes & Noble make more money if they sold more paperbacks and displayed them cover outwards as is done in Waterstones? Or is the main profit in hardbacks? Regardless, I suspect we'll all agree it should be a priority to get more children reading more picture books, and for adults to enjoy spending time sharing the books. By the way, if anybody would like to put me right on the differences I've noticed between the UK and US, it'll be lovely to read your comments. Thanks. Fascinating to see the differences, as well as puzzling. Thanks, Anna, and I'm still puzzled! 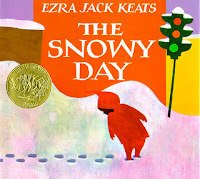 Hello Paeony - I wish that the states offered more affordable picture books than they do. I have a grandson that I buy for and some hardback books I will pass up because of the expense. Hi, I'd buy fewer picture books if there wasn't the paperback option. Mind you, although not a picture book, I remember debating whether to buy the second Harry Potter book as a hardback when it first came out, but decided to wait for the paperback, and then it took off in a big way and that hardback would have been worth a bit now! That's really interesting, Paeony. I can't answer your questions about why the US goes more for hardback books with jackets, but I'd be fascinated to read the answer if anybody knows. In Italy earlier this year, I noticed how the one children's bookshop I visited had more picture books for older children than you tend to find in the UK. I meant to ask, did you look inside that book with the title The Dead Bird?! I didn't notice at the time, Pippa, though I see it's another classic Margaret Wise Brown book and it has just been reillustrated, hence the 'new book' status. Definitely a noticeable title! That really is interesting. I'll be watching the comments to see what other people say! Thanks, Candy, and I too am hoping some answers to my confusion will appear in the comments. I read some American mummy blogs and in a lot of them hardcover picture books are displayed in their kids bedrooms with the covers out - sort of as art. Ikea spice racks work for this. Its like the books are part of the interior design - along with chalk paint walls and Zara home style bedlinen. Anyway, I don't know if thats the reason for all the hardcovers but maybe? I love this blog post, as I've thought about this a lot! That's so interesting, Lucy - many thanks. Picture books as artworks/interior design sounds entirely plausible as one of the reasons (though I don't live in their world so this type of 'designer' bedroom isn't familiar to me and I just looked online at chalk paint walls!). To me paperback picture books are more inclusive and encourage reading as they're not 'precious' and are cheaper, though some hardbacks are utterly gorgeous as items to possess. Yes, really interesting, Paeony. I'm also looking forward to reading some answers as I don't have any. Thanks, Jane, and perhaps some more answers will appear overnight. What an interesting post. 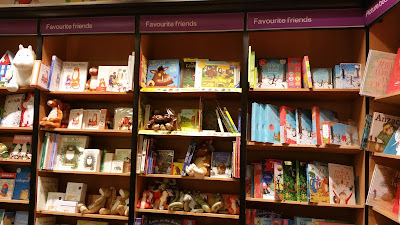 I dream of spending the day in a Waterstone's because I am a big fan of picture books from the UK. I do buy a lot of them and import them but there are a ton that you have over there I can not get. I used to own a kids bookstore and am now a picture book writer myself. As far as the hardbacks, that is just the way it always is. Almost all picture books come out in hardback and the really big sellers will eventually get a paperback version. Scholastic book fairs often buy rights to a newer release and make a cheap paperback out of it for their school book fair program. Hardbacks do cost the consumer more for sure. As a writer, I want a hardback as it pays better per book. I recently looked at Maverick's website and was considering submitting something to them but noticed they were all paperback so that made me think twice about that. How do you put books in your libraries then if they are not hardcover? Softcover books wouldn't hold up at all for a library. Do you have library bindings that are different? As far as purchasing them as a consumer, sure they are often gifts, grandmothers love to buy books, but regular people buy books for their families too. I myself average two or three hardbacks a month. Because they are not cheap, I only buy the ones I LOVE. If it is only so so, we get it from the library instead. The spinner display you are talking about has been around a long time. These displays are often found in other types of retailers like big box toy stores, grocery stores, large Wal-Mart type stores as well because they are a very inexpensive pick up item. As far as Julia Donaldson, most US bookstores will stock the Grufffalo and a large number often carry Room on the Broom. I have seen Superworm in a few but that is not as common. When I had my store, I stocked Stick Man. Here, the Gruffalo's Child can only be bought in paperback for some reason. I wish it came in Hardback so I can have a matching set. That was the only book I carried in my store that was paperback and only because it was the sequel to one of the best picture books of all time. Our libraries do have a ton of her other books in them however. As far as facing the books cover out instead of spine, I agree with you. I have no idea why most stores here do that. Amazon is beginning to open brick and mortar bookstores around the country and they do display the covers facing out so that may change here. Maybe Barnes and Noble will follow suit. As far as the dust jackets, yes they do rip sometimes but the cover underneath has the same image so you can just throw it out if it gets ruined. I don't know if they serve any purpose except to keep "dust" off the book underneath. I have some books in the Pip and Posey series from Nosy Crow that are hardback in a vinyl type material and I love this format, but I have never seen it on an American book. 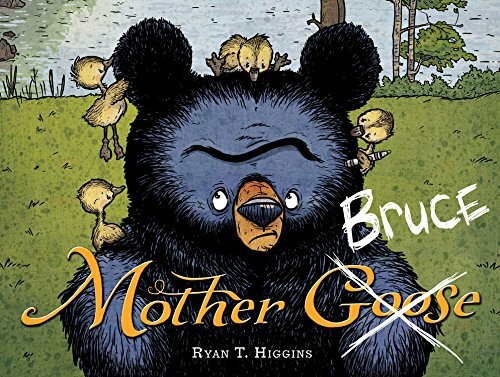 As far as the grumpy books, that may just be a trend but you did buy the best grumpy book out there right now- Mother Bruce. I would be interested in what books you were referring to that made fun of bad parenting. Have you read Chicken Clicking from Jeanne Willis? That one from your side of the pond made me shake my head in amazement that it was published. I thought it was great, but maybe too controversial? Thanks for your fascinating observations. Wow! Thanks so much for all your interesting observations, Tara. I’d wondered if the US predominance of hardbacks was a new thing – obviously not. In the UK it always used to be that a small print run of hardbacks would herald a bigger print run of the paperback version (eg 1000 hardbacks, 6,000 paperbacks). All my traditional picture books had hardback and paperback versions in the UK (albeit they’re older and times are changing). Libraries used to buy a good number of these hardbacks. Nowadays many picture books are published without a hardback edition (as you discovered) and libraries tend to stock a lot of paperbacks (budgetary reasons). Libraries usually add strong translucent standard plastic covers to the paperbacks, as they do with other books and often do in schools. I’m still surprised about the jackets as they’re not child friendly and I feel children should be comfortable with books. Jackets must get easily damaged in stores and when I worked at a non-fiction publisher I remember extra jackets used to be run off the presses to allow for damage. I suspect it’s a bit psychological on my part as if a book has a jacket I feel it’s ‘collectable’ and therefore must be treated with care and I find that a bit annoying! I’d much prefer the expense of a jacket be replaced by other gorgeous things like spot varnish, embossing and gilt (but never glitter!). For example, the hardback of ‘No More Yawning’ in the UK had tactile spot varnish, whilst the US had a jacket. I didn’t know Amazon had started opening stores in the US. I’ve just looked on Google images and yes, the books face outwards. I like this but you need a lot of space and I wouldn’t want smaller bookshops to reduce their range – it’s a dilemma. I wish I could remember the tongue-in-cheek bad parenting books – sorry. Yes, Jeanne Willis books published by Andersen can occasionally raise eyebrows, though I think it’s good to get people talking. ‘Tadpole’s Promise’ was another that made many gasp. Just looked - lovely stuff! I must admit I do aspire to having these beautiful kids bedrooms but they are SO expensive BUT I have framed a few beautiful dust jackets - so they do have a use! Along A Long Road is one - so it was worth the ten or so euros it cost me. And YES I agree so much that picture books are not seen as the preserve of toddlers. Kids of eight, nine and ten can enjoy them so much. Just looked up the retro-looking, stylish 'Along a Long Road' - I wonder if we'll see it here. Interesting that it is made up of one 35ft digital image. Interesting article - thank you. I'm completely with you on the dust jacket front - the few that we've been given with dust jackets have had them removed and they now reside gathering dust on a high shelf, so we don't have to be too precious about the book! Thanks, Jenny. Ha ha, I too have jackets gathering dust up high, or stuffed and forgotten in drawers. Glad I'm not alone! Hi, US children's librarian here! My first and biggest response to this is "I WISH people here were better about not casting picture books aside as soon as kids are five!" That's my biggest peeve. Okay, one of them. I think the industry is just so full of picture book lovers we all just keep putting out older-aimed titles in the HOPE that people will finally appreciate them. As for hardcovers, yeah, they do tend to be bought as gifts, but even if not outside-of-the-household-special-occasion gifts, bought with the intent that they will be kept for a long while and read over and over, and also last longer. As a librarian I'm biased, but I always think that people use libraries to test books out and THEN they buy the books they KNOW they'll like, but I know there are many other areas of the US where libraries aren't as conveniently located (I'm blessed to be in SW PA, homeland of Andrew Carnegie. I mean post-Scotland), so I can't speak for all those people. (As a librarian I'm also biased toward hardcovers because paperback picture books just get lost and/or destroyed in the libraries, but that's libraries, we don't shop at B&N for that). As for dust covers, I HAVE NO IDEA. They're not a PROBLEM, they just really are pointless at home. In the library we put our book labels on them and then cover them with plastic and tape them on, so they really DO protect the books a bit, but at home they're just there until they get torn and thrown out and nobody really cares. Some books have cool "secret" covers by having the actual hardcover be something different from the dust cover, though. 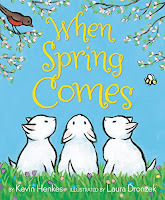 In my experience, you see paperback picture books most often as giveaways in large quantities, or through school book orders, or through charitable organizations that give books away. You also see more of them in non-strictly-bookstore shops, supermarkets and department stores and places like Walmart and Target-- these are more likely to be sure-sellers, like already-bestsellers or media tie-ins or cheesy I-love-you books that great-aunts pick up because they make them go Awww. I think that might be part of it too-- people who want more disposable books are going to get them at Target, while people who really CARE about books are going to Barnes & Noble, where they put more thought into their purchase? Lovely to hear from you and read your thoughts. I agree about picture books for older children and you’ve just inspired me to buy a pricey out-of-print hardback to replace my tatty paperback of ‘Varmints’ (Ward & Craste) as it’s a favourite and I only have a worn copy. ‘Varmints’ is one of those picture books that is definitely for older children. The ‘secret’ covers of some hardback books with dust jackets sounds intriguing (do you have a favourite? ), though then I’d have the dilemma of whether to keep the dust jacket and I assume as they’ve covered over in the library they remain hidden. I’d still rather publishers did away with dust jackets and added other extras to hardbacks. For example, ‘A River’ by Marc Martin (Templar 2016 edition) has the most gorgeous embossed (?) jungle cover that’s so tactile. I’m very happy for people to buy ‘disposable’ paperback books because personally I think it helps to make the reading of books part of everyday life. 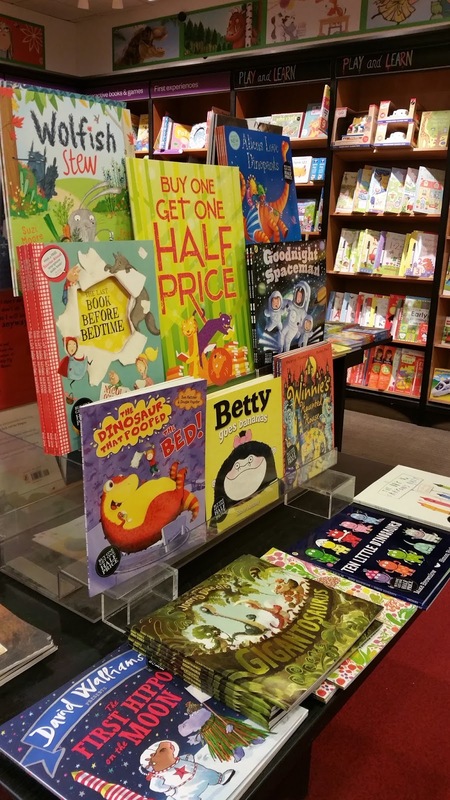 We too have places where paperback picture books are heavily discounted (eg The Works and The Book People) and authors/illustrators get frustrated at the miniscule royalties but at least more children are reading. Overall, I think cheaper paperbacks are far more inclusive, whilst pricier hardbacks are brilliant for those that can afford them or want to cherish a special book. And of course, thank goodness for wonderful libraries and librarians! Such a fascinating blog. And great comments from our US friends. I'll be checking back to read more. BTW - Different geographic regions do like different art styles. That's a thesis in itself, right there! Many thanks, Moira, and would you like to write a blog post on different art styles and regions - I'd love to read it! I found this a fascinating read as well! It's so interesting to compare the big bookstores in different countries as well as the books found there in. Perhaps a bit of traveling is in order to check for more differences in other countries? 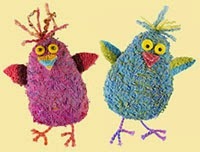 I know an elementary school teacher who decorates her classroom walls with the dust jackets from picture books. I love that idea! One thing that baffles me is why a typical hardcover picture book at $16.99 is considered expensive. That's about the same price as most hardcover middle grade novels, which don't have all the beautiful artwork found in picture books. And hardcover adult novels are typically $25.99 and up. Do people consider those too expensive as well? It's a curious thing. Thanks a lot, Lauri. Yes, we should explore the bookshops of the world! I agree that a hardback book isn't necessarily expensive when compared to other hardbacks and I think some adult hardcovers are way overpriced (and some Kindle books too). I was thinking of the difference between the price of a hardback and paperback and how in the UK the average parent doesn't like to pay too much for books for young children (or pay anything in many cases and if you're struggling to buy essentials then that's understandable, though sadly there's also the attitude that picture books aren't 'real books'). We're simply more used to paperback versions (I'm not including board books in this generalisation) and that influences our psychological price acceptability, which is why I was so surprised at all the hardbacks in Barnes & Noble. From all the comments I now appreciate it's a different setup in the US. Years ago I had a picture book publisher here in the UK. Blackie and Son Ltd only ever published hard back books, they would often sell paperback rights to other companies. American publishers tended to prefer dust jackets too but things started to change here after the demise of the net book agreement. This lead to a lot of discounting and small publishers found it difficult to compete, larger companies have to work on very tiny profit margins, the larger retailers want huge discounts which does not help. The last two books I illustrated both came out in hardback with dust jackets but you will struggle to find them in most bookshops except for a few indies. Many thanks for commenting. I agree, the end of the net book agreement in the UK in 1997 did change things and we began to expect discounted books and have begun to be psychologically disinclined to pay 'too much' for books. However, I think the tide is starting to turn a little as a few more hardback picture books are creeping into UK shops as book buyers are starting to want a book to be a special experience that's distinct from digital books. 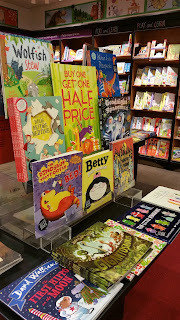 Yes, they're mostly in independent bookshops, though Waterstones started using very small wall displays with the hardback picture books facing outwards, albeit I've noticed this has started to dwindle a bit in my local Waterstones - maybe not enough people buying them? We're a mean bunch here! I think adults in the US will buy hardcover books that they judge to be classics (or soon-to-be classics) for their durability. That hard cover keeps edges from getting ragged and can withstand drops and sit-upons without bending. If you end up buying a $7 paperback picture book twice, it doesn't seem too much of a stretch to fork over $17 from the start. Funny enough, I also think Americans would think £7.99 ($10) too high a price to pay for a paperback book. 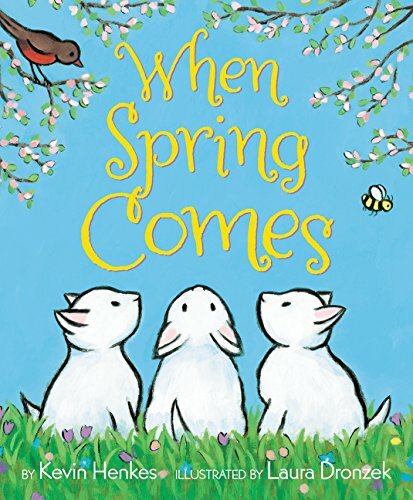 Also, because the printing of paperbacks often lags a year or more behind the printing of a hardcover, the urge to have the newest, talked about picture book can persuade people to part with a few more bucks. Keeping up with the neighbours, after all! That being noted, once kids hit reading age, the shift to paperbacks is immediate. It's rare for adults to buy hardcover easy readers, early chapter books (a category that seems to be only US - think Horrid Henry), or novels, unless the book is an award winner. I guess the thought is that, unlike a picture book, a novel may not be reread, so it's not worth investing in a hardcover copy. Money stretches with paperbacks! As for dust covers, I don't have an answer. But I do wonder if there's a cost difference in printing a book cover directly vs a plain cover with a coated-paper jacket? Any US editors out there who might know an answer to this? I think it's wonderful how many books can be displayed face-out at Waterstones. 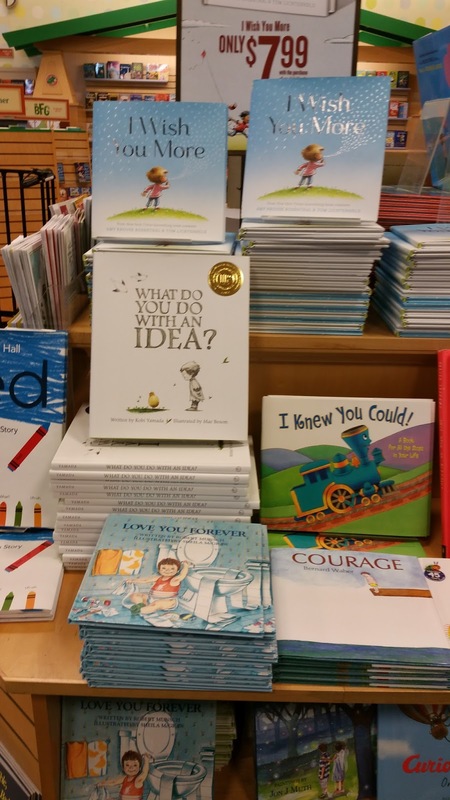 A picture book gets a very short window at B&N in which to prove itself before it is pulled from the shelves and returned; having your title go face-out plays a huge part in that equation. (And it's why I surreptitiously put friends books face-out when I'm in a B&N). What interesting observations - thanks so much, Patricia. I'm beginning to get the feeling that much of the emphasis on cheaper UK paperbacks (previously £5.99 and they now seem to be £6.99 everywhere, without any small incremental rises - strange) really is a by-product of the desire by British consumers for cheaper books. If the hardbacks don't sell well then the bookshops won't stock them in the UK. Obviously in the US independent stores and Barnes & Noble you've found hardbacks sell better, which might be partly a function of a larger consumer base combined with a history of hardback sales, along with a desire to preserve those childhood moments. I'd mistakenly assumed the emphasis on hardbacks was new - I didn't realise it has always been that way in the US. Interesting. Great interesting post! I don't have anything to add except that I'll be in London later this month. 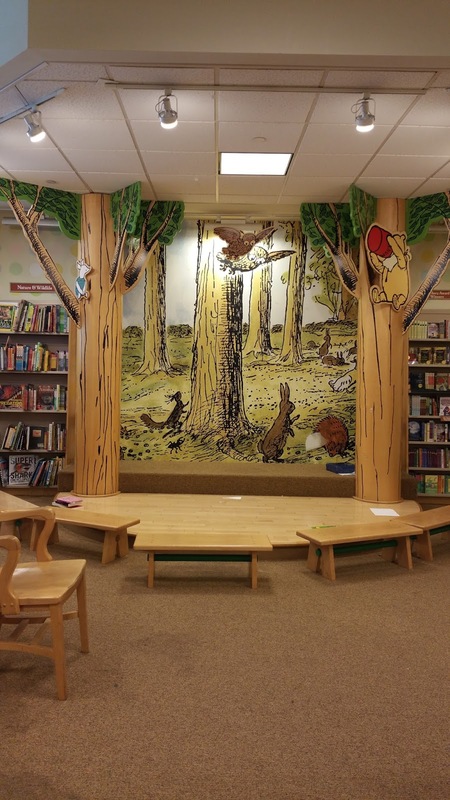 What children's bookstores do you recommend I visit? Of course there are lots of inspiring bookshops around the country but if I start listing them then I'm bound to miss somebody out. Happy book hunting! Many thanks, Elizabeth. Yes, yes, please do a comparison - a guest blog on this and the Caldecotts and Greenaways would be amazing. Good luck with your dissertation and have an amazing time in beautiful Scotland. What an excellent post! 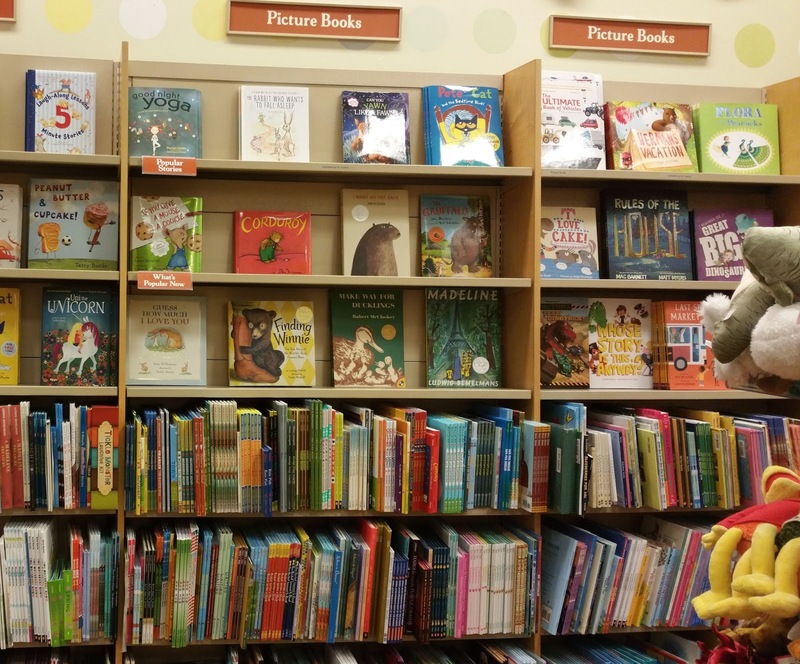 As a US author of picture books, I am always frustrated with the way picture books are shelved here. I love the full-cover displays at Waterstones. As for the dust jackets on hardbound books, they are the very first thing my grandson would remove and toss whenever I gave him a new book. I think they were originally intended to 'protect' the book, but now maybe they serve to justify the cost. Now I am looking forward to traveling to the UK to see one of my picture books released there in December --- at least I know I won't have to squint at the spines to find it! Thank you for the wonderful post. Huge thanks, Stephanie. I suspect the book collector in me can't help feeling guilty if dust jackets are damaged, even if they annoy me. If they weren't there then I wouldn't feel guilty! Yes, nowadays I suspect they're there to add an 'extra', but there are so many other lovely things that can be done to hardback covers without using flimsy paper! I hope you spot your latest book when you visit the UK - have a great trip (your dollar is now worth more, sigh!). By the way, I hope I haven't misled you because you won't find all UK bookshops have every paperback facing outwards - in this instance I was just commenting on Waterstones as it's a big chain. 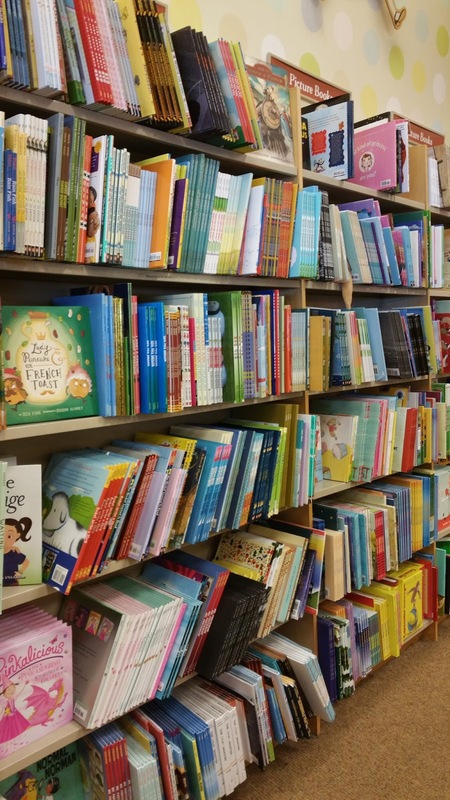 As an avid reader, author of children's books, and advocate for Children's Literacy, I loved the chance to read your observations of the bookstore differences. As to your BOOK START comment, the only thing I can think of comparable to this program is Dolly Parton's Imagination Library where children, newborn to age 5, can be enrolled to receive a new picture book every month from birth until age five. Millions of children participate and I think it's a wonderful way to introduce child to the world of books! Good to hear from you, Donna. I hadn't appreciated that children receive a new pb every month - that's utterly brilliant. I've just taken a look at the UK and US websites for the Dolly Parton Imagination Library and I'm a little confused but I suspect that's because not that many areas in the UK have an 'affiliate' and there's a registration process (and I can be a bit dim!). Anyway, it's highly commendable and I'm impressed Dolly has spearheaded this. I gather that with Bookstart the funding is always under threat but under 5s are gifted a selection of picture books at 0-12 months and at 3-4 years. These books are given out by health professionals to ensure every child receives them automatically. I believe the past Prime Minister, Gordon Brown, was an advocate. I noticed that some other countries are offering similar schemes and in the USA it's 'Reach Out and Read', though it's not national and is focused on low-income families that need it the most. It's wonderful to hear about all the projects. -Yes, we buy the hardcovers as gifts, but there are plenty of places for paperback picture books. One of the big ones is Scholastic Book Fairs and book order clubs which kids get access to at schools. Some of these are later editions of hardbacks, some are (what I would judge) lower quality books like "Princesses Love Puppies," featuring Disney princesses (and I can't get rid of it if I value my life around here). I can't count how many cheap paperbacks we've got squeezed on our shelves with the nicer hardbacks. Also, a current "thing" in fast food chains is to sometimes include a cheap, small book instead of a toy with kids meals--we've got a ton of those, too. A lot of paperback "I Can Read" come from these sources, too. -Dust jackets: someone else mentioned maybe it's cheaper to print art on the jacket than on the cover. They do tend to get torn up; when my kids were little, I'd take them off all together. Maybe publishers imagine them as the first line of defense before the book itself is torn? I vastly prefer hardcover picture books. We've bought some through book fairs. But they are harder to find on the shelves (for early readers) and they get torn/disappear faster. Once they start reading, I've noticed kids going book to book, reading spines until they settle on the book they want to read. Paperbacks must still be flipped through to figure out which to read. And mostly are not re-read the same way. I almost never buy books for myself - hardcover or paperback - except cookbooks. I just get them from the library. But I DO buy lots of children's books (ostensibly for my kids but really for me!). I used to go the paperback route as they are cheaper but soon discovered that for me, the hardcovers are worth it, often for the endpapers alone, not to mention durability. My older child was fine with dustaackets; my younger one always took them off every book. They are NOT always the same as the cover underneath (the cover is often more boring/simple) so I hate it when she does that! Personally, as an American (not an Australian despite my website name - that's taken from my favorite picture book), I want to come to the UK to buy books by British authors as written in the original British English and with the original British titles (e.g. Murder Most Unladylike rather than Murder Is Bad Manners). Hi there - interesting post. My observations as a picture book writer in the UK. I'd written a story about poo. Loved by the UK editors ( Foyles used to have a poo section in its picture books) but aside from the "everyone poops" story I say years ago in hipster parents' homes, poo and farts are a big no no in US publishing, but adored over here as we English like toilet humour. Personally I ALWAYS try and buy a hardback. I think picture books deserve to look as gorgeous as possible. I have a big problem with so many of the UK picture books being so fairy, bear and cake obsessed. The US seem to take bigger risks ( bigger country, more able to ) with theirs, certainly illustration wise. The States seem to adore what I call Bert and Ernie books - conversation between one character and another ( or indeed the reader) - we do this less and less over here. As for rhyme, I rhyme, and for years I was told "don't do rhyme it's just for the likes of Julia Donaldson" however, I find more and more books rhyme over here now, interesting to me as the UK is so reliant on foreign trade.